Salehian, M., Mohammadian, A., Vaezzadeh, M., Saeidi, M. (2017). Influence of Size on the Melting Temperature of Metallic Nanoparticle. 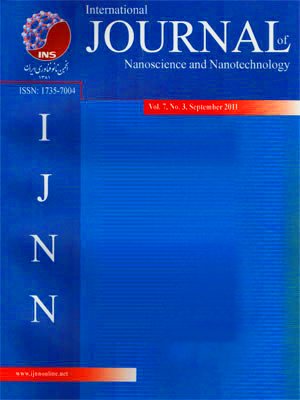 International Journal of Nanoscience and Nanotechnology, 13(1), 91-95. M. Salehian; A. Mohammadian; M. Vaezzadeh; M. Saeidi. "Influence of Size on the Melting Temperature of Metallic Nanoparticle". International Journal of Nanoscience and Nanotechnology, 13, 1, 2017, 91-95. Salehian, M., Mohammadian, A., Vaezzadeh, M., Saeidi, M. (2017). 'Influence of Size on the Melting Temperature of Metallic Nanoparticle', International Journal of Nanoscience and Nanotechnology, 13(1), pp. 91-95. Salehian, M., Mohammadian, A., Vaezzadeh, M., Saeidi, M. Influence of Size on the Melting Temperature of Metallic Nanoparticle. International Journal of Nanoscience and Nanotechnology, 2017; 13(1): 91-95. In This paper, the effect of size on melting temperature of metallic nanoparticles (Au, Pb and Bi) is theoretically simulated and explained. In this regard, the cause of difference in various experimental data is introduced, which is the difference between nanoparticles’ grain Gaussian distribution. This volume-depended model with the help of the Gaussian distribution can describe the relation between nanoparticle melting temperature and its size. The obtained results are interestingly consistent with reported experimental data. 1. Pawlow, P., (1909). “Über die Abhängigkeit des Schmelzpunktes von der Oberflächenenergie eines festen Körpers”, Z. Phys. Chem., 65: 1–35. 2. Takagi, M., (1954). “Electron-Diffraction Study of Liquid-Solid Transition of Thin Metal Films”, J. Phys. Soc. Jpn., 9: 359-363. 3. Storozhev, V. B., (1998). “The solid-liquid phase transition in nanoparticles contacting with a solid surfaceThe solid-liquid phase transition in nanoparticles contacting with a solid surfaceThe solid-liquid phase transition in nanoparticles contacting with a solid surface”, Surf. Sci., 397: 170-178. 4. Jiang, Q., Zhang, Z., Wang, Y. W., (2000). “Thermal stability of low dimensional crystalsThe solid-liquid phase transition in nanoparticles contacting with a solid surfaceThe solid-liquid phase transition in nanoparticles contacting with a solid surface”, Mater. Sci. Eng. A, 286: 139-143. 5. Qi, W. H., Wang, M. P., (2004). “Size and shape dependent melting temperature of metallic nanoparticles”, Mater. Chem. Phys., 88: 280-284. 6. Safaei, A., Attarian Shandiz, M., Sanjabi, S., Barber, Z.H., (2007). “Modelling the size effect on the melting temperature of nanoparticles, nanowires and nanofilms”, J. Phys: Condens. Mat., 19: 216216. 7. Mirjalili, M., Vahdati-Khaki, J., (2008). “Prediction of nanoparticles’ size-dependent melting temperature using mean coordination number concept”, J. Phys. Chem. Solids, 69: 2116-2123. 8. Nanda, K. K., (2009). “Size-dependent melting of nanoparticles: Hundred years of thermodynamic model”, Pramana, 72: 617-628. 9. Kim, E. H., Lee, B. J., (2009). “Size dependency of melting point of crystalline nano particles and nano wires: A thermodynamic modeling”, Met. Mater. Int., 15: 531-537. 10. Kang, K., Qin, S., Wang, C., (2009). “Size-dependent melting: Numerical calculations of the phonon spectrum”, Physica E, 41: 817–821. 11. Hudson, D. J. (1967). “Statistics for Physicists”, Mir publishers, Moscow. 12. Schmid, G. (2001). “Metals”, in: K.J. Klabunde (Ed. ), “Nanoscale Materials in Chemistry”, John Wiley & Sons Inc., New York. 13. Sambles, J. R., (1971). “An Electron Microscope Study of Evaporating Gold Particles: The Kelvin Equation for Liquid Gold and the Lowering of the Melting Point of Solid Gold Particles”, P. Roy. Soc. Lon. Ser-A, 324: 339-351. 14. Buffat, P., Borel, J. P., (1976). “Size effect on the melting temperature of gold particles”, Phys. Rev. A, 13: 2287-2298. 15. Skripov, V. P., Koverda, V. P., Skokov, V. N., (1981). “Size effect on melting of small particles”, Phys. Status Solidi A, 66: 109-118. 16. Coombes, C. J., (1972). “The melting of small particles of lead and indium”, J. Phys. F: Met. Phys., 2: 441–448. 17. Allen, G. L., Bayles, R. A., Gile, W. W., Jesser, W. A., (1986). “Small particle melting of pure metals”, Thin Solid Films, 144: 297-308. 18. Kellermann, G., Craievich, A. F., (2002). “Structure and melting of Bi nanocrystals embedded in a B2O3−Na2O glass”, Phys. Rev. B, 65: 134204.